More grassroots organizations are forming in Michigan and joining the fight against fracking. The October 24th protest in Lansing at the Michigan Department of Natural Resources auction of state-owned mineral rights brought more needed attention to the plight of our state and how it’s being sold off to the oil and gas industry for hydraulic fracturing and a fossil-fuel based future. Organized by a group called Citizens Against Drilling on Public Lands, the October protest brought out individuals and groups from all over the state, including a Barry County-based group, Michigan Land Air Water Defense, which filed a lawsuit against the Michigan DNR that day to protect state game and recreation areas in Barry and Allegan Counties. Protesters made a stand both inside and outside the auction. Seven people were arrested and jailed. We applaud both actions and the courageous people who took a stand against the selling of our state, and to the new group Michigan Land Air Water Defense for their important lawsuit against the DNR. Ban Michigan Fracking was there as were petition circulators for the Committee to Ban Fracking in Michigan. This was not the first time the State auctioned off mineral rights to the oil and gas companies. Since the advent of the new horizontal hydraulic fracturing technique, similar auctions in 2010, 2011 and in May 2012 netted the state millions of dollars in royalties and many thousands of acres were auctioned. (See DNR’s Oi & Gas Lease Auction website and the DNR Mineral Lease Information Maps for each county. Much of the recently-auctioned land is destined for deep horizontal hydraulic fracturing or fracking. While the focus of the protest was on the selling of state-owned lands, mineral rights under private land was also auctioned off by the DNR that day. An Ogemaw County resident, who owns an 80-acre farm, but not the mineral rights below the surface, asked the DNR if he could buy his mineral rights. He was told no because they were being auctioned off, nor could he attend the auction and buy them. They were sold out from under him for $10/acre. The fate of his 80-acre farm is now in the hands of the oil and gas industry. To understand more of the full picture of just how much of Michigan is going to be fracked, one has to realize that public land (state parks, state forests, other publicly-owned lands such as county and township parks) and privately-owned land whereby the landowners do not own their mineral rights, have been auctioned off by the State for drilling. Many landowners do not realize that the “rights” to what’s below the surface of their property, may not belong to them. Before the movie Gasland appeared, the documentary Split Estate portrayed this phenomenon and how families in the West are devastated by oil and gas drilling, while the gas and oil industry ravages their land, water and air. How much land is there in Michigan? According to the MSU Planning and Zoning Center, there are 37 million acres of land in Michigan. Fifty-four percent of that is forested, 30% is agricultural and 6% is urbanized. 7.5 million acres, or about 20% is comprised of state and federal forests. The DNR is responsible for 4.3 million acres of state land. Another 24.5 million acres are owned by thousands of private landowners, who may or may not own the rights to the minerals below the surface. The Michigan House of Representatives issued a bi-partisan report in March 2012, Natural Gas Subcommittee Report on Energy and Job Creation, which reveals the State of Michigan controls 6 million acres of mineral rights. The House Subcommittee urges the State to “lease or lose” them. Doing the math, it seems that 1.7 million acres of private land–like the 80-acre farm in Ogemaw County–are in control of the State. But that’s not all. Even if you are one of the landowners of Michigan’s privately-owned 24.5 million acres of land, if you held out and did not sell off your mineral rights, in Michigan you can get fracked under your land anyway by being compulsorily forced into a “pool” by the DEQ. Investigative reporters at ProPublica did a state-by-state comparison of all the states’ forced pooling laws. Michigan’s compulsory pooling law (MCL 324.304) allows the State to force landowners who refuse to sign leases with the gas and oil companies into drilling units against their will. When landowners take it to court to prevent the forced pool, DEQ Assistant Supervisor of Wells, Hal Fitch, is the Lone Decider. Here’s one example of a case in Kearney Township in Antrim County. Regretting your decision to lease? And then there are the people who have already sold off their mineral rights to the frackers, and may regret their decision. We urge landowners who are now thinking twice to contact us about starting a group like Fleased (www.fleased.org), landowners in New York state who now are fighting the gas industry to get out of their leases. Don’t own your mineral rights? You may be able to buy back your mineral rights from the State, but as the DNR website states, there are no guarantees it can or will. Earlier this year, Reuters reported on how energy giants Chesapeake Energy and Encana colluded to keep auction prices low (Encana tipped off Chesapeake to land plans in Michigan, July 11, 2012). Encana is currently fracking Michigan, while landowners who signed up with Chesapeake have sued that company for reneging on leases. (See: Northern Express, Natural Gas Blues: lawsuits abound a year after the boom went bust, August 19, 2011; Forbes, Chesapeake bid-rigging scandal could be the final blow for McClendon and Rolling Stone, The big fracking bubble: the scam behind Aubrey McClendon’s gas boom, March 1, 2012). By September, Encana did an internal investigation and declared itself innocent (See: Shaleshock Media: Encana: the hens are safe). There is an ongoing investigation by the U.S. Justice Department and the Michigan attorney general. (Note: Attorney general Bill Schuette received over $59,000 in campaign donations from the frack industry according to Michigan Common Cause). Already the State of Michigan is conducting fracking operations in our state forests. New York’s forests were defended against fracking in a lawsuit brought against the state of New York by some residents and a watershed group in Croton Watershed v NYDEC. In their suit, they declared “that industrializing State Forests with the newly proposed natural gas extraction process known as High Volume Horizontal Hydraulic Fracturing (HVHHF) is contrary to the enabling legislation authorizing the purchase of lands for State Forests and is inconsistent with the responsible stewardship of State Forests, sustainability and policies of New York State as set forth in the State Constitution, Environmental Conservation Law (ECL), and Common Law Public Trust Doctrine.” The Croton Watershed group obtained a court ruling that the case is a constitutional issue, and so far, New York has prohibited any drilling. Michigan Land Air Water Defense‘s lawsuit against the state is very exciting, and many Michigan voters will be following it closely. 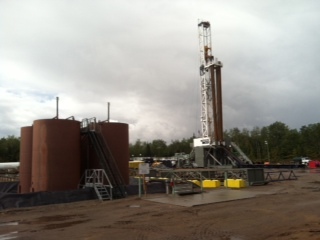 The drill rig at the Excelsior wells on Sunset Trail in the Mackinaw State Forest, Kalkaska County. Photo by LuAnne Kozma.